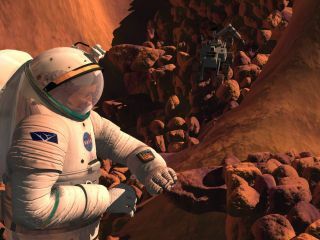 An artist's depiction of humans working on Mars. The hearing was coordinated by Sen. Ted Cruz (R-Texas), who is chair of the Subcommittee on Space, Science, and Competitiveness. "Mars is today the focal point of our national space program," Cruz said during opening remarks. "If American boots are to be the first to set foot on the surface, it will define a new generation — generation Mars." "We have to have a vision that lasts more than one administration," veteran astronaut Peggy Whitson said. "We have to have a budget line that will support those goals and objectives that we are striving to reach." The industry representative on the panel underscored that point as well, citing the challenge of retaining expert staff when mission budgets are unpredictable. "Funding stability is absolutely vital in industry," said Tory Bruno, head of United Launch Alliance. "If you don't have work for the people on your team to do, they scatter." "You can't put a price tag, you can't put importance on how Apollo fundamentally changed all of us," said Dava Newman, an engineer at the Massachusetts Institute of Technology. "That's how I look at the Mars mission now — we get humans there with all our great science, it will just lift us up." But she was also careful to mention more concrete potential benefits, like anti-cancer advances that could spring from tackling the threat posed by radiation in space. All those tasks mean NASA can't do it alone and needs to find a way to bring other countries as well as private companies into the mix. "People make it sound like the government is actually building all the hardware," said Chris Carberry, head of Explore Mars, a nonprofit organization dedicated to promoting exploration of Mars. "They're not."